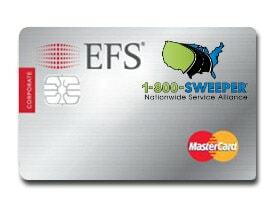 The EFS MasterCard® Corporate Card provides 1-800-SWEEPER Partners a single card solution to manage and control spending in the areas of fleet purchasing or T&E on one platform, with flexible card management tools that put individualized spending controls in your hands. Our EFS Fleet Card deal helps improve productivity and performance by delivering enhanced fuel & maintenance expense management. Dashboards and customized reporting helps 1-800-Partners significantly improve compliance and reduce unauthorized employee purchases. The EFS credit card offers the ability to manage and control transactions and purchases from a macro-level down to a single card. Change purchasing authorization and spending criteria quickly and easily.